After years of near-zero interest rates, investors are finally starting to see some options to make a little income on their cash. In Exhibit 1 below are some of the safer investment options our clients have to invest their cash today. As always, nothing on this blog should be considered an investment recommendation, these are just some simple examples of what’s out there. Most of our clients’ cash is held in the Bank Sweep feature, which is FDIC-insured and logistically same as cash – checks, deposits, withdrawals come and go directly without any intervention. The trade-off for this safety and convenience is a relatively low interest rate at 0.22%. 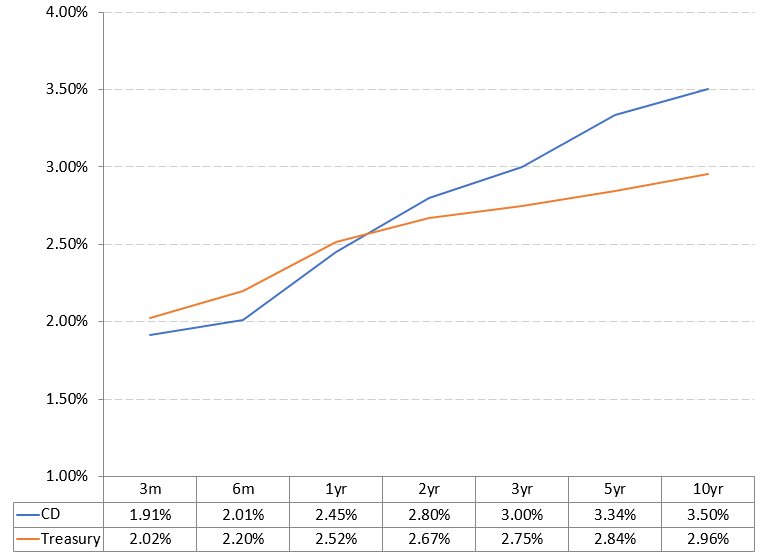 A more attractive option is a Prime Money Market fund which is very safe and yields a much healthier 1.88%. The catch there is that it has to be bought/sold just like a mutual fund which is difficult with a lot of cash flows in and out of the account. I would say that for it to make sense for everyday cash, it would need to be $50,000 or more (although there is no minimum investment). Note that Money Market reform made these funds even safer, but there is a very small chance of liquidity issues (lock up, not loss) in extremely volatile market conditions (think November 2008). The other two money market fund options probably don’t make sense for most investors (see notes). Then there are non-Schwab investment options that are slightly more involved. You can open an online savings account and transfer cash into it. See Exhibit 2 for sample rates at various banks. It’s a little convoluted to deal with another bank to transfer money back and forth. Moreover, with Money Market rates in-line with these savings accounts, FDIC protection is the only real benefit. You can also purchase CDs or Treasury Bills either in your Schwab account or through a bank itself or TreasuryDirect. One year rates are about 0.60% better than money market but make sure you won’t need the money before maturity or face an early withdrawal penalty. For comparison, some of the other maturity terms are shown in Exhibit 3. Finally, I also wanted to compare Schwab’s deposit & money market rates to some of the other large brokerages, so Fidelity and Vanguard are shows in Exhibit 4. Schwab and Fidelity are neck and neck given how directly they compete with each other. Vanguard is known for its low expenses and does offer slightly higher rates. 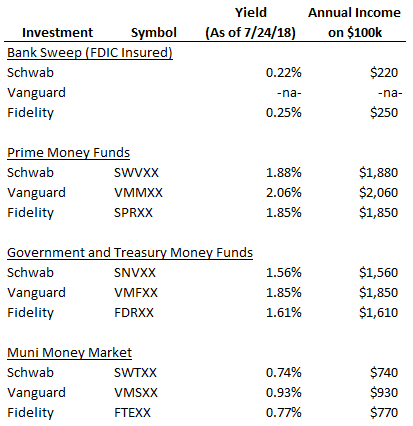 Moreover, Vanguard Federal Money Market fund (VMFXX) IS the sweep option and it’s much easier to get these rates on smaller balances with a lot of cash activity. So cash is finally starting to pay decent rates and there are many options. For most people I would say that Bank Sweep is the way to go for everyday smaller balances and Money Markets are great to stash larger holdings that you won’t need for a while. However, other options I mentioned might makes sense in specific circumstances. Please contact us if you would like to discuss your cash investment needs.